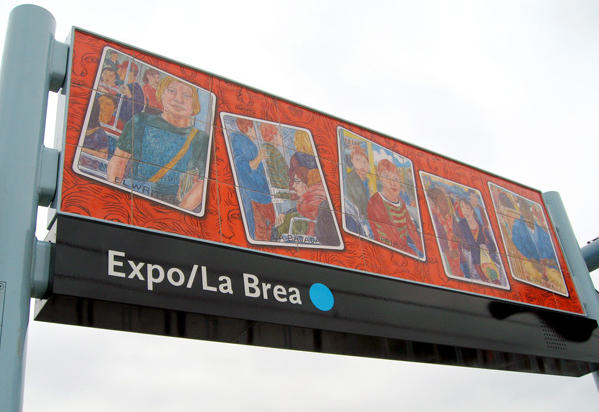 Jose Lozano presents a series of Lotería cards, based on a Mexican game of chance, in his artwork for Expo/La Brea Station. Similar to Bingo, Lotería uses images on a deck of cards instead of numbers. In text at the bottom of the cards, Lozano plays with the station name “La Brea,” keeping the Spanish language prefixes “La,” “El,” or “Los,” and substituting “Brea” with passenger interactions commonly encountered while riding Metro. Detail of LA Metro Lotería, displaying “Los Stairs” and “La Nurse,” at the artwork fabricator, Winsor Fireform. Detail of LA Metro Lotería, displaying “Los Romantics” and “Los Metro Guys,” at the artwork fabricator, Winsor Fireform. 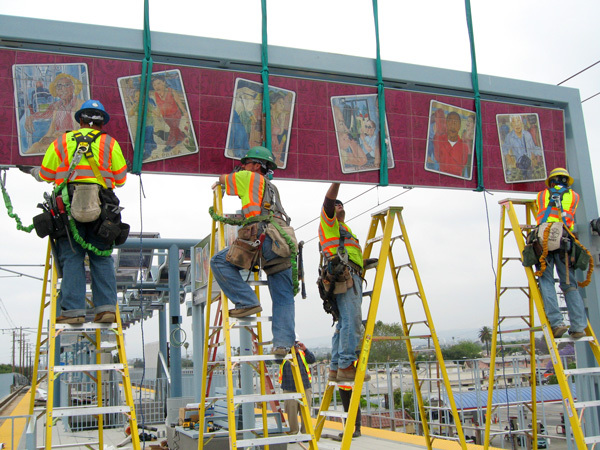 More photos of the artwork being installed at the station are after the jump. 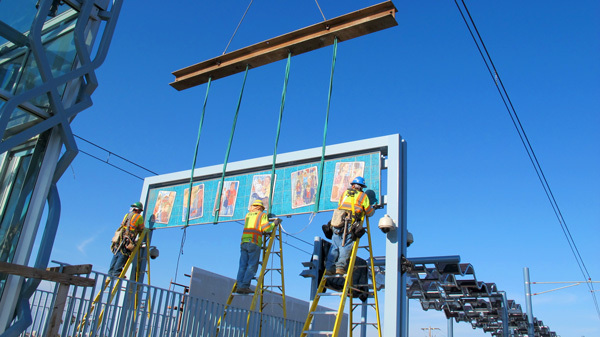 Art panel on its way to the station platform. 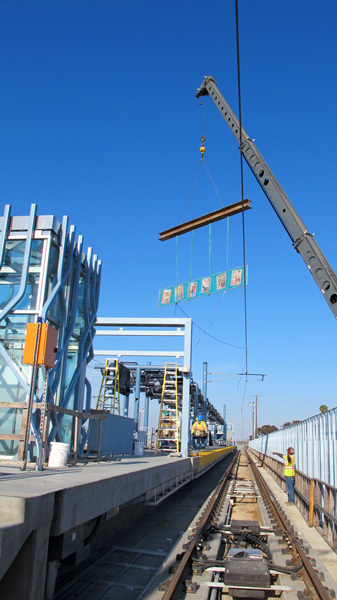 Note the steel bar above the art panel that provides stability as the 21 foot-long panel is moved into place. 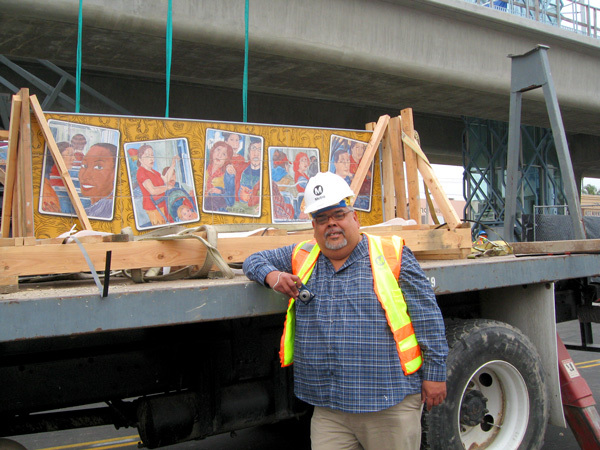 Art panel installed and ready to be enjoyed by transit users. Curious readers may glimpse the (uncovered) artwork on the aerial station platform if they look up from the street level. Spanglish; charming and appropriate. Good choice, Metro! I love the Expo Line Art and I will enjoy Mr. Lozano’s art every day when I take the Expo Line at LaBrea. It speaks of community.